You think dealing with a Middle Child is difficult? Here's where you'll find something to satisfy even the hardest to please Middle Child. As families get smaller, Middle Children are on the verge of extinction! Don't go down without a fight. Share our plight with the world, one tee at a time.ENDANGERED SPECIES emblazoned on the back. Show your Mid Kid Pride with merchandise emblazoned with the Middle Child flag and motto (Attentionem Ante Omnia --Attention Above All! )on the front, and the Mid Kid pledge on the back. 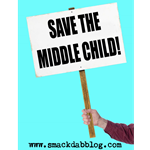 Let's move Middle Child's Day from August 12 to a day that makes more sense, like July 2 -- the Smack Dab middle of the year! Join the movement!! Tired of wearing clothes that have been worn before? Choose from the world's largest collection of never-before-worn hand-me-down apparel! Middle Children know how to negotiate. That's why politicians have to stop acting like children, and start acting like Middle Children! The ONLY place to get official Middle Child Party merchandise. It's true: Middle Children really do have a different way of seeing things! Let the world know when your Middle Child Syndrome is running high. Of course, if you're a Middle Child, you know that's EVERY day! If you're looking for something to help ease the pain of Middle Child Syndrome, we've got just what the Doctor ordered!